Nuclear energy's fuel supply infrastructure should be able to meet world demand in the short term, but expansion will be needed across the entire fuel cycle beyond 2020, warns the latest WNA market report. The newly released report, The Global Nuclear Fuel Market Supply and Demand 2009-2030, is the fifteenth in a series which started in the mid-1970s. Produced by a drafting group drawn from member companies of the World Nuclear Association (WNA), the report is based on the knowledge and opinion of the whole industry. The report uses information gathered via questionnaires from WNA members representing all aspects of the fuel cycle across the globe. A computer model is then used to forecast nuclear fuel supply and demand to 2030. Of the three scenarios presented for world nuclear capacity up to 2030, only the lower scenario sees nuclear generation failing to increase above its 2008 level of 371 GWe. The reference scenario sees an overall 2.2% growth rate reaching 476 GWe by 2020 and 600 GWe by 2030, while the upper scenario sees 558 GWe by 2020 and 818 GWe by 2030. Both reference and upper scenarios are higher than in the 2007 edition of the report, reflecting the emergence of India and China as major nuclear nations. In a new departure, the latest version of the report produces its three scenarios for nuclear generation to 2030 by country (as opposed to by region), and takes a closer look than ever before at the separate fuel cycle steps of enrichment, conversion and fuel fabrication. Production of uranium from mines - primary production - has been far below the amount required to fuel the western world's power reactors since the mid-1908s, with so-called secondary supplies - inventories, stockpile drawdowns and use of recycled materials including uranium from decommissioned nuclear weapons - making up the shortfall. However, although secondary supplies will continue to play an important part, the report warns that the period of primary supply being so far below annual reactor requirements will have to come to an end with a substantial need for new primary production facilities in the longer term. "Uranium production needs to increase dramatically from its current level," Cameco's Penny Buye, co-chair of the drafting group, told the Symposium. The market must ensure that conditions be conducive for this to happen, she added. The need for long term expansion to support reactor requirements also extends to fuel cycle services. Although conversion, enrichment and fuel fabrication capacities appear to be sufficient to cope with demand up to 2020, new investment will be needed to meet demand under the upper and reference scenarios in the longer term. 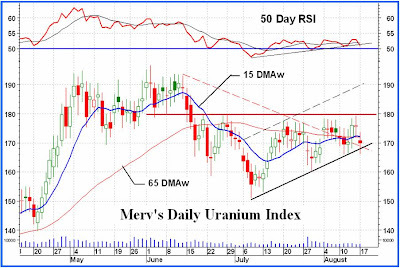 New uranium mines take many years to plan and license before they start production. The same is true, to some extent, for new conversion, enrichment and fuel fabrication facilities, the report notes. Heavy reliance on secondary sources of uranium supply over recent years has resulted, the report notes, in the industry's supply infrastructure becoming somewhat neglected, and also potentially vulnerable to supply disruptions. "This damage must be repaired over the next period", the report concludes.